The leadership of the International Biathlon Union (IBU) makes a mistake by continuing to hold World Cup stages in North America, and the Russian national team coaching staff missed by sending team leader Alexander Loginov there. Such an opinion on the results of the stage in the Canadian Canmore was expressed by four-time Olympic champion Alexander Tikhonov. In turn, two-time world champion Dmitry Yaroshenko believes that Dmitry Malyshko will be in a more advantageous position in the world championship in Sweden, who is preparing for a tournament in his homeland. At the same time, the three-time world champion Pavel Rostovtsev urged not to make hasty conclusions about the state of the Russian team, but to evaluate its results following the results of the main tournament of the year. "The decision was made by a drunkard and reveler Mr. Besseberg"
One of the main results of the 7th stage of the Biathlon World Cup in Canadian Canmore was the cancellation of sprint races due to the severe frosts, which were originally supposed to take place instead of mass starts. According to the weather forecast, by the time the men's sprint started at Canmore, it should have been minus 26 ºС, so the organizers for the first time in 20 years decided to cancel the race due to frost. This provoked another wave of stormy debates about the feasibility of holding biathlon competitions in North America in principle. In particular, many have criticized the leadership of the International Biathlon Union (IBU) for risking the health of athletes, allowing them to start. According to the four-time Olympic champion Alexander Tikhonov, organizing a tournament on another continent leads only to losses incurred not only by the organization itself, but also by national federations. However, many of them do not have the ability to send their biathletes to North America. The blame for this state of affairs Tikhonov places primarily on the former IBU President Anders Besseberg. “All the old members of the IBU Executive Committee remember that the decision to conduct these stages was made by a drunkard and reveler Mr. Besseberg ... I was totally against it, spoke from the podium, asked the committee of athletes. What did you get from this? Every year the biathlon caravan goes there in an incomplete composition, ”Tikhonov wrote. In the publication on his official website, he added that in the North American phases, "organizational incidents also happen all the time." At the same time, the well-known Russian commentator Dmitry Guberniev spoke positively about the competitions held in Canmore, highlighting the hospitality of the locals. “People are great! Every now and then you hear: "Welcome to Canada." I am for the stages in North America to pass every year. By the way, here and in Europe, I often meet athletes who buy products in supermarkets, because the food is more than modest. I have never watched something like that in Tyumen. Everything is already there, and everything is very tasty and useful, ”the Championship quotes the journalist. In turn, the Olympic champion in biathlon and ski racing Anfisa Reztsova recalled that in the recent past, athletes had to face more difficult conditions due to the lack of modern equipment that protects from low temperatures. “Nature is created in such a way that everything is unpredictable. In my time there was no such weather here. Of course, if the organizers knew the forecast for this time, then, in principle, they could turn everything back. But there was no such opportunity. Moreover, races are allowed up to -20˚C. This is not the fifty-degree frost, as we have in Yakutia, ”she cites her words“ Match TV ”. Reztsova also noted that the organizers made the right decision, refusing to conduct sprint races. In her opinion, it had a positive effect on the Russians. “Even if they wanted, they couldn’t show anything in this frost. In the two disciplines held our guys performed with dignity. Who knows how they would run a sprint, and they would be freezing too much. And so the forces saved, ”she concluded. "Young people have organisms - they will cope"
Despite the fact that the stage in Canmore turned out to be blurred and caused a lot of problems both to the biathletes and to the coaching staff, some experts tried to analyze the condition of the Russians, who in less than a month have to play at the World Championships in the Swedish Ostersund. Most of their attention was focused on team leader Alexander Loginov. On the eve of the head of the St. Petersburg Biathlon Federation Dmitry Vasilyev in a conversation with RT stated that the athlete was forced to take part in the North American stages, mainly because of the ongoing struggle for the second position in the overall World Cup. 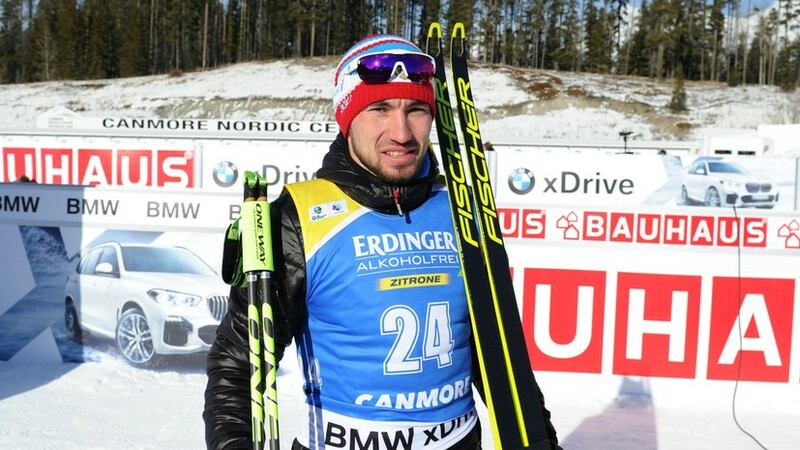 As a result, this decision is still justifying itself - Loginov took third place in the individual race, and also helped the national team to win bronze in the relay. At the same time, many expressed the fear that participation in the stages in Canada and the United States would adversely affect the physical condition of the Russian, and he would not be able to perform in full force at the forthcoming world championship in March. However, three-time world champion Ivan Tcherezov hastened to assure the fans that even such long-distance flights would not harm the athlete. “I went on such tours, and they did not affect me. It was a competitive practice that suited me very much. After the American stage, the guys will have enough time to recover. It will also help that the world championship will be held in Ostersund. The difference in time zones will not be so critical, ”Cherezov is sure. His point of view is shared by the former biathlete Pavel Vavilov. According to him, none of the Russians should have problems with acclimatization, as they are in North America for a short period. “I myself started twice in Canmore. And in the United States at the World Cup, too, ran. Of course, there are certain discomfort and difficulties. We have to endure long flights, get used to another time zone, then return to the previous mode. But the guys' organisms are young and trained - they can handle it, ”Vavilova quotes the official site of the Russian Biathlon Union. "Everybody will be a smart afterthought"
However, not all experts hold the same position. According to the two-time world champion Dmitry Yaroshenko, Loginov will not be easy to fight for the World Championship medals in Ostersund, and another biathlonist may take the place of the leader of the Russian team at these competitions. “In the best position in our team is Dmitry Malyshko, who is quietly preparing and performing in Sweden in the best possible shape. Loginov and Garanichevu will be much more difficult. It is clear that Alexander wants to stay in the top 3 or top 2 of the overall standings. But the World Cup medal will be valued much higher. It would not have turned the exchange on trifles, "- said Yaroshenko. Alexander Tikhonov also took a critical position regarding the coaching staff of the Russian national team for Loginov’s trip to North America. In addition, he did not like some of the statements of the Russians, who allowed him in a conversation with the press. “I would ask Sasha to be more careful about the interview. Now we don’t need statements about thick blood, about the fact that a girl came to him and now his head is free. Sasha, do not make the world laugh! Speak briefly and clearly ... It's time to be a serious athlete, you are not 17 years old. It's great that you started to smile, but at the same time you need to think about what you say, ”the former Tikhonov advised. As acknowledged by Loginov himself, his mood really improved after winning two bronze medals at a stage in Canada. This was confirmed by the Olympic champion Yevgeny Redkin. “I think nothing terrible happened, and Sasha will take his glasses again. In Canmore, he, apparently, felt good. Prior to that, Europe went gloomy all the time, and then finally smiled. We will see what will happen now at the American stage, ”said the former athlete. At the same time, the three-time world champion Pavel Rostovtsev urged not to make hasty conclusions about Loginov’s form, but to evaluate its results based on the results of the world championship. “Everything is individual. Now nobody will tell you what is good and what is bad. Everyone will be an afterthought clever. If Alexander performs unsuccessfully at the World Championships, they will say: “It was necessary not to drive, but to train.” And if everything is normal, on the contrary, they will declare: “We said that it was necessary to go. Insisted on the fact that Sasha spoke. There was nothing terrible about this, ”the daily Sport portal quotes Rostovtsev.